Welcome to the 3rd annual Spooktacular Giveaway Hop! From Oct 24th to 31st. It’s hosted by I Am A Reader, Not A Writer (badge above links to our host’s site) and is co-hosted by The Diary of a Bookworm. This is a huge blog hop with over 500 blogs hosting bookish giveaways. What a great way to celebrate the “scary season” – winning books! 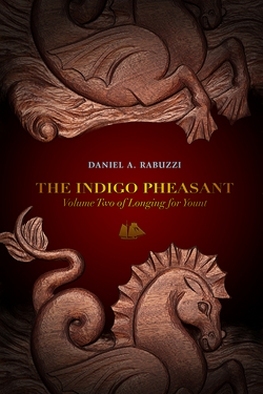 We have one copy (an ebook in your choice of format, so it’s international) of: The Choir Boats (Longing for Yount #1) ~ by Daniel A. Rabuzzi. It’s the first in this young adult two-book set, and part of the - Longing for Yount series, with the second book just published in September. Although it’s young adult it’s very appropriate and recommended for adult readers too. For more about the author and a wonderful guest post where he talks about the creative process please see: A Picture-Show in the Night-Kitchen. It’s a lovely post. London, 1812 | Yount, Year of the Owl What would you give to make good on the sins of your past? For merchant Barnabas McDoon, the answer is: everything. When emissaries from a world called Yount offer Barnabas a chance to redeem himself, he accepts their price -- to voyage to Yount with the key that only he can use to unlock the door to their prison. But bleak forces seek to stop him: Yount's jailer, a once-human wizard who craves his own salvation, kidnaps Barnabas's nephew. A fallen angel -- a monstrous owl with eyes of fire -- will unleash Hell if Yount is freed. And, meanwhile, Barnabas's niece, Sally, and a mysterious pauper named Maggie seek with dream-songs to wake the sleeping goddess who may be the only hope for Yount and Earth alike. London, 1817 Maggie Collins, born into slavery in Maryland, whose mathematical genius and strength of mind can match those of a goddess, must build the world's most powerful and sophisticated machine -- to free the lost land of Yount from the fallen angel Strix Tender Wurm. Sally, of the merchant house McDoon, must choose either to help Maggie or to hinder her. Together -- or not -- Maggie and Sally drive to conclusion the story started in The Choir Boat, a story of blood-soaked song, family secrets, sins new and old in search of expiation, forbidden love, high policy and acts of state, financial ruin, betrayals intimate and grand, sorcery from the origins of time, and battle in the streets of London and on the arcane seas of Yount. This hop and giveaway are now completed. Please come back and visit for our up coming giveaways. The winner for The Choir Boats is Michael V. Congrats Michael!